What kind of valves does Everlasting Valve manufacture? Our company manufactures four different types of valves that are designed to meet the needs of a huge range of severe applications. We manufacture a process valve that’s ANSI Class rated for handling dry abrasives and slurries to 1500°F and up to 10,000 psi. The process valve is fully customizable and available in virtually any body material, trim, or actuator. Our bulk material valve, or BMV, is designed to handle dry abrasives in pressures up to 100 psi. It is available in single or bi-directional sealing, in cast iron or carbon steel for temperatures up to 550°F or in carbon steel only for temperatures up to 750°F. We also manufacture a diverging/converging valve in cast iron or fully customizable fabricated designs for handling of dry abrasives and slurries. Our steam-boiler-blowdown valves, the first valves produced by Everlasting Valve, meet ASME/ANSI Boiler & Pressure Vessel Code for blow-off service. Our valves can replace ball valves, gate valves, globe valves, and pinch valves in a variety of applications. Doesn’t the open-body design cause the valve to become clogged with particulate? Nope! Our open-body design allows fines to move about freely, preventing accumulation that binds up moving parts and damages seats in other valve designs. As the rotating discs cycle through the body, they displace the media that’s swirling about the valve so that it’s cleanly discharged. The materials we work with are exceptionally harsh and abrasive. What kinds of materials can your valves handle? Our valves literally have never met a material they can’t handle. Battle-tested in the toughest, harshest industrial apps in the world, from hot-catalyst handling to fluid-catalytic cracking, our valves can handle any type of slurry, dry solid, sludge, abrasive, or other erosive material you can throw at them, and they’ll just keep coming back for more, year after year, even decade after decade! Gate valves, ball valves, and other valves are simply no match for an Everlasting valve. The actuator moves the post and lever arm, which drives the disc. The entire sealing surface of the disc is constantly in contact with the seat through force exerted by springs. These springs allow the disc to move vertically, which compensates for thermal expansion and contraction of the valve’s components—also overcoming the effect of any backpressure for which it was designed—and prevents particles from lodging between the sealing surfaces. Differences in tangential disc-to-seat-friction forces cause the disc to rotate on its seat as the valve cycles, thereby shearing and wiping away any process material that may accumulate while also polishing the sealing surfaces. What temperature extremes can your valves handle? Our valves are rated to handle extremely low temps, down to -50oF as well as extraordinarily high temps all the way up to 1500oF and everything in between! Do you have a valve currently in service in my application? It’s highly likely, since our valves have been manufactured for well over a century and are deployed all over the world. In any application in which ball valves, gate valves, globe valves, or pinch valves are currently in use, there are Everlasting valves in the same types of applications, doing a better job at handling the abrasive media that even the toughest environments throw at them. We design and build custom valves for virtually all types of severe-service applications, so it’s a sure bet our valves will meet your industrial-plant needs. Want to hear more about some real-life examples? Just give us a call! Can you come to my site and discuss my requirements? Yes! That’s generally our first step whenever we’re called in to customize a valve for a customer. This way, we’re able to evaluate your unique plant environment and learn about your needs and challenges first-hand. I do not see a valve that meets my needs/fits my application. Do you design and manufacture special valves? Yes! Our valve technology is based on an extremely flexible design, and our engineering team is exceptionally talented. We’re confident we can custom-build a valve that will meet your needs. Please complete the Request for Quote form and we will be happy to discuss it with you and develop a valve design to meet your requirements. How do I get a quotation for a valve? For quotations on process valves, bulk-material valves or diverting/converging valves, please complete a Request for Quotation form below. For quotations on boiler-blowdown valves, please call our office at (908) 769-0700 or email info@everlastingvalveusa.com for price and availability. How long does it take to receive a quotation? This will depend on the type and size valve. Boiler valves can be quoted immediately by phone or on the same day by email. Most quotations for process valves, bulk-material valves or diverting/converging valves will be quoted in one to two days. For large valves or valves with complex process requirements or special or unique construction, producing an accurate quote could take up to several days. How do I place an order for Everlasting valves? We accept purchase orders by phone, fax, mail, or email. We also have representatives in various locations around the world who can work with you to place your valve order. Contact us to be connected with one! After placing an order, how soon before my valve will ship? Subject to credit approval or purchased by credit card, most boiler valves will often ship from stock in three to five days. Cast-iron bulk material valves in sizes 2” through 8” are usually in stock and can usually ship within three to seven days, depending on which accessories are ordered with the valve. Process valves and the diverting/converging valves are designed and built based upon your specification and process parameters; therefore, it is difficult to state shipping times until the Request for Quote form is reviewed. We stock parts for carbon-steel process valves and can usually ship within four weeks. Valves above Class 300 as well as those made using special materials, actuators, or accessories can take a bit longer. Need a valve sooner? Please contact us to discuss your needs and requirements and we’ll do our very best to meet your specific timelines. Everlasting Valve Company accepts most major credit cards and, subject to credit approval, we offer you the opportunity to create purchase orders with net-30 payment terms. We also will process orders on COD or Check in-advance basis. Can I buy directly from Everlasting Valve Company? Our boiler valves can be purchased directly from us or from distributors. Our specialty line of valves, including our process valves, bulk material valves, and diverting/converging valves—are only available directly from our facility in New Jersey. We also have representatives in various locations around the world who can work with you to place your valve order. Contact us to be connected with one! Why are your valves so expensive? Everlasting valves are an investment. Upfront, they appear to cost more than our competitors’ ball valves, gate valves, and globe valves, which is why, very often, our customers come to us after other valves failed. Don’t make the mistake of buying an Everlasting valve as a last resort! Contact us before wasting time and money chasing solutions that quit early, cause problems, and create headaches. Everlasting valves are the answer to all your troubles! The severe-service valves we’ve been perfecting for more than a century work better, last longer, and are tougher and stronger than any other valves on the market today. They’re made for the harshest industrial applications on the planet—those that are simply too severe for other valves to survive. In fact, we have valves deployed in plants that have been in operation for 50 years! Where are Everlasting Valves manufactured? What certifications does Everlasting Valve Company hold? 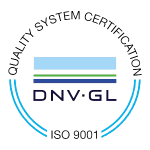 Everlasting Valve Company’s quality-management system is ISO 9001:2015 certified by DNV GL. This achievement reflects our continuous commitment to achieving superior product quality and reliability for our current customer base and new client prospects. Can Everlasting Valve Company manufacture valves certified for the European Market? Everlasting Valve Company offers valves that are CE-certified and meet the certification requirements of ATEX, the Machinery Directive, and the Pressure Equipment Directive (PED). Does Everlasting Valve Company repair valves? It’s not often necessary, but yes, Everlasting Valve Company will evaluate and repair any valve that we manufactured. We do not repair valves from other manufacturers. Contact our office for instructions on how to return a valve for evaluation and repair. Can I buy parts from Everlasting Valve Company and repair the valve myself? Yes, you can buy original Everlasting Valve parts from us to repair your valve. Be sure to have your original purchase order number or valve serial number (which begins with SO), which ensures we supply the correct parts for the valve as it was manufactured.